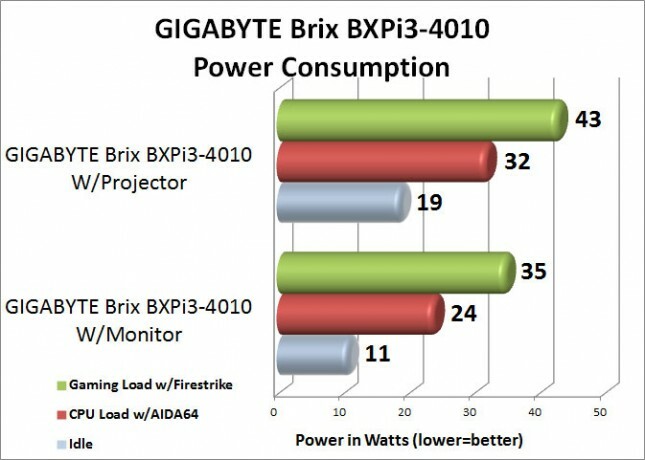 This is probably one of my favorite aspects about the GIGABYTE Brix BXPi3-4010 PC & Projector, the uber low power consumption. Sitting idle the Brix was pulling only 11 Watts at the wall when using a monitor and if the projector was on, it was still only pulling 19 Watts at the wall. Loading up the Intel Core i3-4010U with the AIDA64 system stability test the unit was still only puling 24 Watts and 32 if we were using the projector.